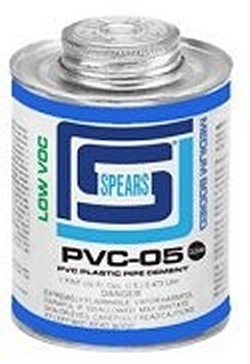 Spears PVC Glue | Medium Clear PVC Cement | FlexPVC® Spears LOW VOC PVC & Fire Sprinkler System CPVC CementExplore our selection of Spears PVC glue today. This medium clear PVC cement is ideal for use with pipe up to 6" Sch 40 fittings (and up to 4" Sch 80 fittings). If you are gluing larger pipe, or pipe out of round or pipe with large gouges or any other situation where you don't have perfect fit, you should use HEAVY BODIED cements. Browse our selection of Pool-Tite blue PVC glue if you need something for situations where you can't get the pipe perfectly dry.